The images on this page are all of silk-screens, which Morrisseau preferred over lithographs for his limited editions. They are all in stock and for sale in editions of 49 to 99. They are priced at $1250 U.S. and up. The sizes vary slightly, but all are on paper of about 30" by 22" with a border of about 3.5". These silk-screens were all made from original acrylics, some of which are also available for sale, priced from $50,000 U.S. and up. Women and children are recurring themes for Morrisseau. Morrisseau painted and printed many hexagons. The print on the left is a good example of his wry sense of humor, while "Teaching the Young" is part of the theme of nurturing found throughout Morrisseau's work. 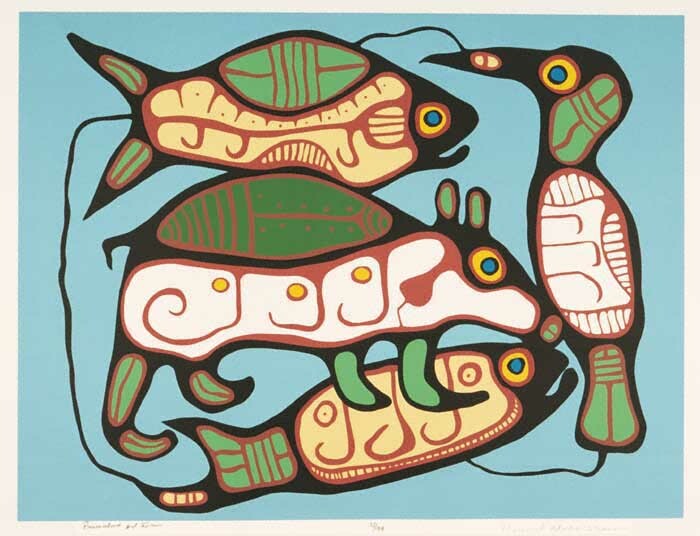 The spiritual was never far from Norval Morrisseau's thoughts or his work.